Fragile returns of wild salmon will likely limit the catch for orcas and fishermen alike. A lean year for orcas and fishermen alike is expected, with poor salmon returns forecast for many species all over the state. Fisheries professionals are working to set fishing seasons on both sides of the U.S.-Canada border for the coming year. So far the news is grim, with salmon forecast to return at just fractions of 10-year averages. For the southern residents, it will be another tough year ahead, with even fewer fish forecast this year than last in many of the important rivers the whales rely on in their seasonal migratory rounds. Below-average returns are predicted from the Fraser to the Columbia, as well as smaller body sizes for most species, according to Department of Fisheries and Oceans Canada. Returns of spring chinook to the Columbia are predicted to be down 14 percent from last year, and at just half the 10-year average. These fish return mostly to hatcheries, but also to some spawning areas above Bonneville dam, and are a mainstay for orcas and fishermen alike. Those fish are particularly important to endangered southern-resident killer whales because of their size, fat content and seasonal timing. Upriver bright and fall chinook returns to the Columbia are also at about half the 10-year average return. The news isn’t better in Puget Sound. Only 29,800 wild chinook are predicted to come back. Protecting those fragile runs will necessitate reductions in fishing of hatchery fish to reduce the unintentional killing of wild chinook. The projected return of hatchery chinook to Puget Sound also is down from 2018, but still 11 percent above the 10-year average. Chum look bad particularly in Puget Sound, with the lowest returns forecast in a decade. There are some bright spots. Coho returning this year missed the worst years of poor ocean conditions, where young fish must fatten and thrive. Coho hatchery and wild returns to Puget Sound are up about 15 percent from the 10-year average, with more than 100,000 fish coming back over last year, and good returns predicted in mid- and South Sound rivers such as the Green, Puyallup and Nisqually. Orcas do eat coho, mostly in winter, and the Green, Puyallup and Nisqually rivers are of particular importance to them. Lack of adequate food regularly available when and where they need it is one of the southern residents’ biggest challenges to survival, and makes all the other problems they face, including vessel noise and pollution, worse. 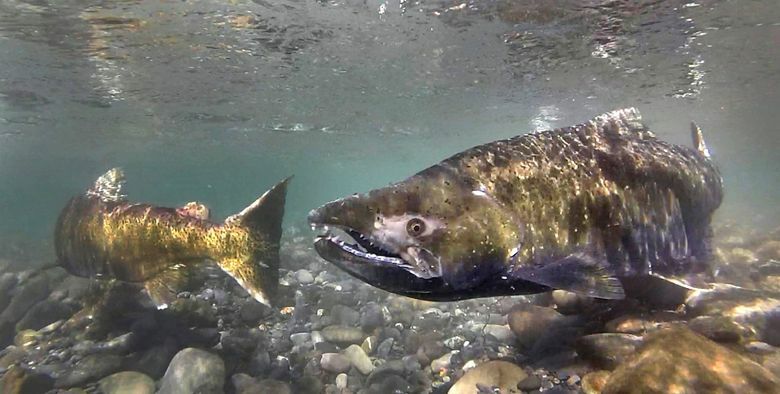 Poor salmon returns this year are due largely to the lingering effects of The Blob, a gigantic mass of unusually warm water off the entire west coast of North America that began forming in late 2014, and intensified in 2015. The warm water upended food chains and killed an uncounted number of animals. The annual June ocean survey for juvenile chinook on the Bell M. Shimada research vessel, deployed off Washington’s coast by the National Oceanic and Atmospheric Administration, has for several years detected below-average survival of juvenile salmon, including chinook, and the persistence of tropical species, all linked to The Blob. Low returns this year will be frustrating for urban Seattle fishermen. 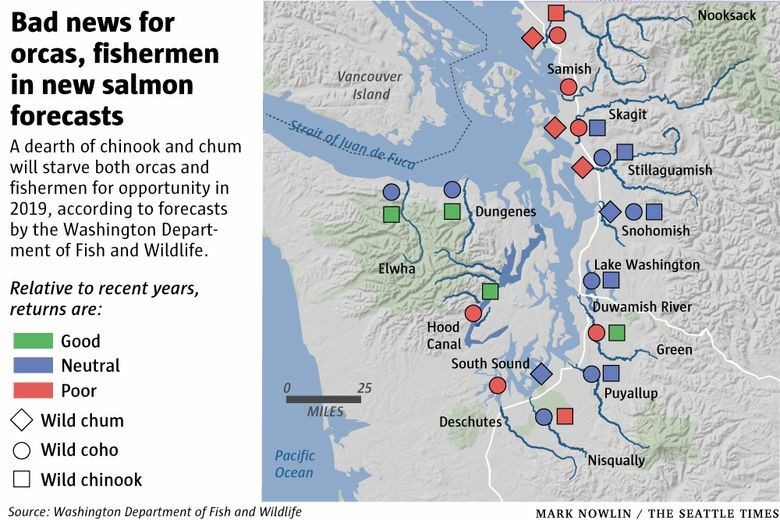 They face a wipeout for sockeye in Lake Washington, with only 15,150 fish predicted to return — down 82 percent below the recent 10-year average, and distant from the more than 350,000 returning sockeye needed for a recreational fishery. There hasn’t been a sockeye season on the lake since 2006, as one of the most expensive, studied hatchery fish runs in the state continues to disappoint. Orcas don’t eat sockeye; they prefer bigger fish for the hunting effort. Mostly what they want is chinook.